We all want to create a life that makes us happy. This could mean finding the right career, making the right friends, or being with the right person. Unfortunately, all of us have subconscious behaviors that could keep us from meeting our goals in this regard. 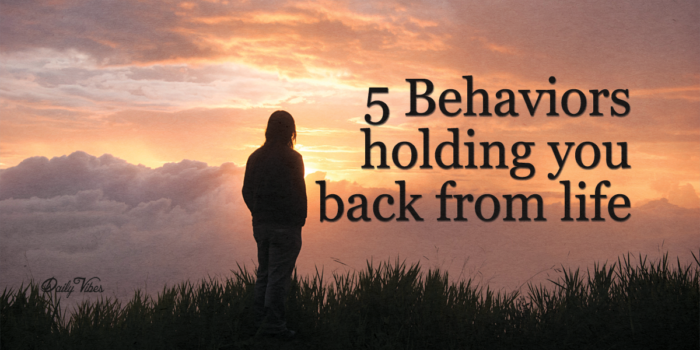 These behaviors stem from the belief system of our culture; once something has been widely accepted as being true, it becomes hard to separate that truth from ourselves, even if it isn’t what we actually want. It’s important that we identify these “truths” in our lives that don’t necessarily work in accordance with our life goals. In order to be happy, we have to figure out what that means for ourselves, and not follow culture’s misplaced guidelines. The problem with thinking this way isn’t necessarily that you’re going out and looking for happiness, but it’s the idea that you know something you’ve never experienced will make you happy. Our brains can only perceive the things we’ve experienced in the past, so there’s no way of knowing what in our futures will actually make us happy. This means that living in the present is the key to real happiness. Culture has told us that success is something that we have to arrive at, once our goals have been reached and our accomplishments accomplished. This means that we’re constantly measuring our current moments based on how much we’ve completed in our lives. There is no physical place you arrive that will tell you how much you’ve succeeded; the only place you’re really rushing to is the end. This is inherently a backward way of thinking. When you take risks in your life that you know will pay off in the future, it can often be scary. Taking a chance by doing something you’re truly invested in will cause you fear and anxiety, but this doesn’t mean you shouldn’t take the chance. The fear you feel when taking a chance is normal and should be embraced rather than avoided. By creating crisis in your life, you’re actually avoiding doing the things that will create vulnerability. You’re scared to be vulnerable, take responsibility, or feel fear, so you create a problem as a means of avoiding those feelings. This means you’re not actually upset for the reasons you think you are, you’re just trying to avoid taking a chance with your life. Don’t think of problems as roadblocks, but think of them as pathways, because that’s what they are. Problems don’t keep us from reaching our goals, they are in fact the ways we reach goals in the first place. If you call something a goal, it means it might be difficult to achieve, otherwise it isn’t much of a goal. There will be challenges that you have to overcome along the way.